I had the pleasure of hosting a webinar with the CEO of Valued Accountancy, Stephen Paul. Stephen shared his experience of transitioning to providing his clients with more of the services that they want and those that are crucial for Valued’s businesses development. Almost every single conversation that I have with partners in practice is “Darren, we get what we should be doing, what we want to know is how”? This got me thinking - rather than tempt attendees with the lure of a utopian vision achieved by simply connecting client data to an application without context, objectives and desired outcomes, or a deeper understanding of how to work collaboratively to assist clients. I wanted to provide attendees with a real world example of how a practice has developed a strategy, executed, failed, evaluated the process, re-deployed and now has a winning formula for delivering advisory services to their clients. For Stephen, it has been a journey; a cliché possibly, but a learning experience most definitely. This has reinforced Stephen’s view that adopting cloud technology more broadly in your practice leads to efficiencies. Valued Accountancy are seeing huge time savings now due to the implementation of Xero, Receipt Bank, Practice Ignition and Chaser across the firm. Now that he has a refined process for efficiency, what Stephen now has is time to focus on becoming more effective using the analytical tools that Spotlight provides. For Valued, the ability to offer all clients either a dashboard or a report means they can become more pro-active and engaged. They are embedding budgeting and forecasting with all of their clients. This additional service of simply importing prior year figures and running an extremely simple budget scenario for clients using Spotlight Forecasting has driven another £40-50k of additional client revenue this year alone. 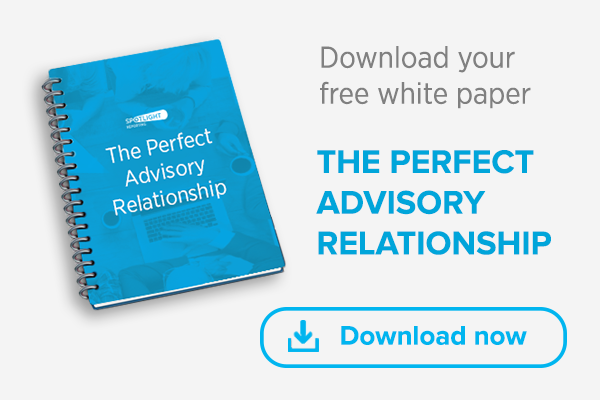 To find out more details on how to develop a winning formula for delivering advisory services, watch the recorded webinar. Also, we’ve put together some key themes that have been captured during the webinar in the infographic below.